Whatever type of office you run – the layout is always extremely important. A poorly-designed workspace can reduce productivity, efficiency and make your employees feel undervalued. If you want to make the most of their abilities, then put some time and money into creating a high-quality office. In this blog, we’re going to discuss a number of things for you to consider when designing the layout of a call centre. Call centres are often an integral hub of the company, so getting this right can bring about a whole host of benefits. The first thing you should think about is space – how much you have and how much each individual needs to properly do their job. You don’t want to waste room by giving people too much, but making them feel cramped is even more detrimental. A good balance is necessary. What does each employee need to do their job? On their desk they’ll likely have a computer and other electrical components, storage space for documents/folder and, with this being a call centre, a phone is also likely. Set up a mock workstation and see what size desk fits all of this, with extra room for personal items and anything else that can’t be accounted for. If people are on the phone to clients all day, then there are fewer chances to interact with co-workers than in a regular office setting. So that nobody gets disturbed or distracted, many call centre operators choose to make each workstation a more private space – with screens used to divide them up. Of course, this isn’t absolutely crucial, and if you feel uncomfortable putting employees in their own little world then, by all means, get rid of the screens. You might want to encourage people to talk to each other – it’s a great way to boost morale and make sure people aren’t sick of staring at the same four walls all day. There are generally two types of layout in an office – although more creative types will tell you there are more – rows and circles. Rows consist of people sitting side by side in a row that can be as long as three or thirty people. Again, this is seen as a design more suitable for those who like privacy. A circular-type design, however, gives people the chance to look at more people that those simply sat next to them – which many would argue gets rid of the frustrating repetition of staring at the workstation. These types of layout are generally suitable for smaller teams. This is quite a big decision that you need to make – is your call centre to be isolated from the rest of the building? Or do you want to combine telephone operators with the other staff? One solution is to meet half way, and select the use of glass walls. This will give the call centre its own space, but won’t cut it off from everyone else. It’s also a great way to boost morale. Separation can create an “us versus them” attitude, so showing inclusiveness can be of great benefit. People will appreciate it if you don’t shut them away from where the rest of the business is operating. 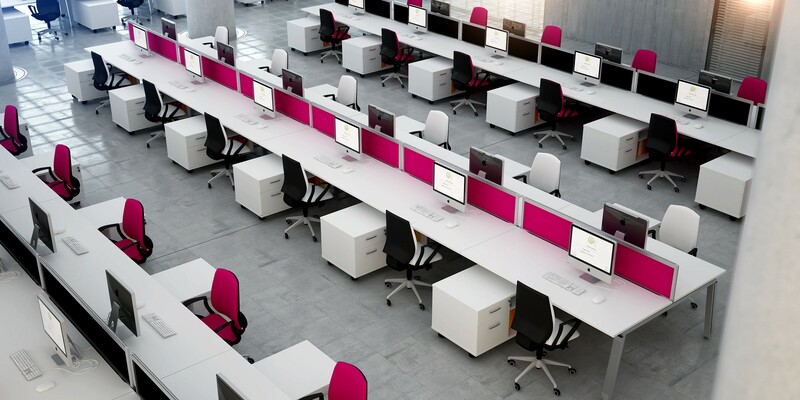 If you’ve got your call centre layout all planned, then check out Planscape UK for some excellent deals on office furniture.